Notes: Original title: Fra Contadini. Dialogo sull’anarchia. Edizioni ‘La Fiaccola’, Ragusa 1972. “... We shall kindle the fire that is smouldering among the masses, take advantage of the discontent, the movements, the revolts, and strike a vigorous blow. We are not afraid, and soon the bourgeois catastrophe will go up in smoke and the reign of wellbeing begin.” These words mark the maximum point of Malatesta’s analyses contained in the present pamphlet. The individual arguments faced, the various theoretical questions take on a different meaning and perspective in the light of this phrase. Taken individually problems such as production, machinery, work, planning, price mechanisms, Government, the State, the revolution considered in abstract terms, can each be treated with that detached perspective which so many comrades have substituted for the true meaning of anarchism. Here these problems take on a different order. 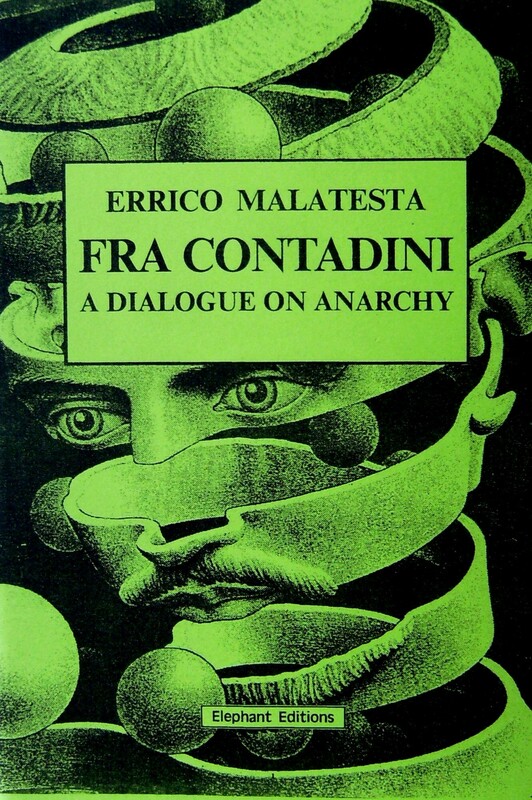 Malatesta’s intent is not to convince a bourgeois liberal in the throes of his guilty conscience, he is not interested in getting into a learned argument with an economist who is still suffering indigestion from Marx, just as he is not interested in putting a sociologist in difficulty concerning the possibility of social organisation without government or State. His aim is to convince the peasant, the worker, the emarginated “lumpen” proletarian reader, of the mechanism of exploitation and repression, of the system of ideological and political swindling, with the aim of pushing them to rebel in the struggle against the class enemies, and, ultimately, to insurrection. Whoever does not bear this objective in mind falsifies the profound meaning of this pamphlet. It is not possible to read truly revolutionary literature in the same key as one would read a sociological treatise. To hear them, God has given them everything and condemned us to poverty and grinding toil. They are to have paradise in this world and the next as well while we’re condemned to hell on this earth and paradise only in the world of yonder, and only then if we’ve been obedient slaves...and if they allow us a place. Take my word for it: today God condemns you to toil because you are poor. If tomorrow you in some way succeeded in getting a lot of money together, no matter how you did it, you’d immediately acquire the right to do no work, ill-treat the peasants, usurp the honour of poor girls ...and God would let you carry on just as he lets your employers carry on. Bert: Gracious me! Ever since you learned to read and write you could confuse a lawyer with your talk. You’ve said things that send shivers down my spine. I’ve seen the way the landlord’s son’s eyes light up when he looks at my daughter Rosina... Oh! if my Rosina...Ah! let’s change the subject. George: You’re right! That’s just what we want! When you want to know something that concerns the poor, never ask the landowners. They’ll never tell you the truth, because no one ever speaks against his own interests. If you want to know what anarchists want, ask me and my comrades, not priests like Father Anthony. Instead, when the priest starts to talk about such things, ask him why it is that you’re eating potatoes (when there are any) and he, who spends the whole day doing nothing with a finger inside a half-shut book, is eating roast beef with his...niece. Ask him why he always keeps in with the landowners and only comes to us when there is something to swallow. Ask him why he always says the landlords and police are right, and why, instead of taking bread from the mouths of the poor people with the excuse of praying for the souls of the dead, he doesn’t do something to help the living a bit, and stop living at others expense. Next time you see Father Anthony, who is young and strong, and who has studied and spends his time in the cafe playing cards or working out fiddles with the town council, tell him that before talking about us, he’d better stop fooling about and learn a bit about hard work and poverty. Bert: True, that seems right to me. The earth and all the things of nature should belong to everyone...But not everything was found right there in front of us. Bert: But...if the world really has always been as it is now, then nothing belongs to the landlords at all. Bert: You’re beginning to convince me ...but tell me, would everybody have to work the land then? Bert: Do you know, you’re beginning to convince me? But there’s something that I still can’t get the hang of. That business about taking everything from the gentry? I don’t know but...couldn’t we avoid that? Bert: No. Really, after all you’ve told me, it seems to me rather that it would be a blessing, because if we took property from the landlords we’d be taking back our blood that they’ve been sucking for so long... And then, if we take it from them, it’s not to take it for ourselves. It’s to put it in common for the good of everyone, isn’t it? Bert: But...if we shared things with the landlords? If they contributed the land and capital and we did the work, then we’d share the produce. What do you think? guided by the common interest of the producers and consumers. It’s like trying to move a boulder: one hundred men try one after the other and don’t get anywhere, nor would they if all tried together but each pulled for his own gain and tried to counteract the others’ efforts. On the other hand three or four people combining efforts and using levers and other suitable tools would lift it up easily. If you set out to make a pin, who knows whether you’ll finish it within the hour, whereas ten men working together could make thousands and thousands of pins per day. And as time goes on and more machines are invented more work will be done in common if progress is to be enjoyed. Bert: I understand everything. We must make a good republic. Everybody equal, and whoever works eats and who doesn’t work goes hungry...Ah! I’m sorry I’m old. Lucky you youngsters who will see these great times. And there’s nothing more to it you know, because all the rest, such as putting an end to military service, or lowering taxes, or providing schools, or protecting the poor, are all promises that will be kept... if it suits the landlord deputies. And when it comes to promising we don’t need republicans, because already now when candidates need to be elected they promise heaven and earth and then, after they are elected, no more is said on the subject. The essential thing is to remember that the revolution is necessary, always to be ready to carry it out, and to be continually preparing it... And don’t doubt that the occasion, spontaneous or provoked, won’t fail to present itself. George: You should know that from the moment socialism has gained strength the bourgeoisie, that is the landlords, have really begun to be afraid and are trying everything in order to avert the storm and deceive the people. Now they are all socialists, even the emperors ...and you can imagine what kind of socialism they’ve put together. Alas, some traitors have emerged from among our own comrades, lured by the flattery of the bourgeoisie in order to attract them, and by advantages they could gain through abandoning the revolutionary cause. They put themselves to preaching legal methods, elections, alliances with the parties—which they say are kindred—and so they get themselves a place amidst the bourgeoisie and treat those who want revolution as mad or worse. Many continue to say that they too want revolution, but, in the meanwhile... they want to be nominated member of parliament. I understand all you’ve told me... and I’ll think about it on my own and try to convince myself more. But you mentioned hardly any of these difficult words that I usually hear said when such things are being discussed and which confuse me because I don’t understand them. For instance, I’ve heard you’re communists, socialists, internationalists, collectivists, anarchists, and goodness knows what. Can you tell me exactly what those words mean and what you really are? Don’t forget though that everywhere and in all ways men have the inalienable right to raw materials and the tools of labour, so that they can always stay free and independent away from the others. It’s true that it isn’t a satisfactory solution, because the dissidents would be deprived of many social advantages which the isolated individual or group wouldn’t be able to procure, and which require the combined efforts of the whole of a large collectivity... but what do you want? The dissidents themselves couldn’t claim that the will of the many be sacrificed to that of the few.